VIP TICKETS NOW AVAILABLE! For $75 you can now purchase VIP tickets, receive VIP seating, and invitation to the VIP party and a free one-year membership with California Jazz Foundation. Please click the button below to buy VIP tickets now. If you want to purchase more than 1 ticket, you may adjust the quantity on the shopping cart page. This entry was posted on Wednesday, February 3rd, 2010 at 11:27 am. 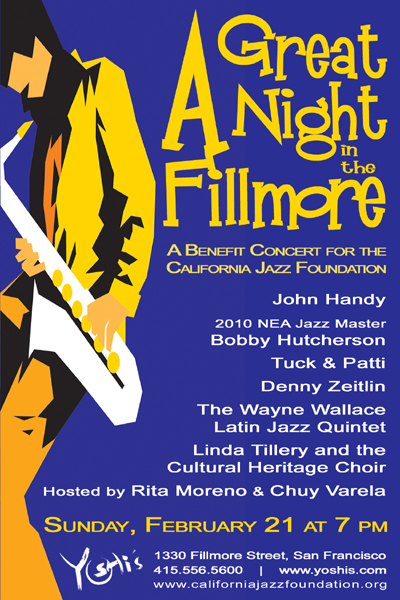 It is filed under Music News/Info and tagged with "A Great Night in the Fillmore", Bobby Hutcherson, California Jazz Foundation, Chuy Varela, Denny Zeitlin, John Handy, Linda Tillery and the Cultural Heritage Choir, Rita Moreno, San Francisco, The Wayne Wallace Latin Jazz Quintet, Tuck & Patti, Yoshi's. You can follow any responses to this entry through the RSS 2.0 feed.